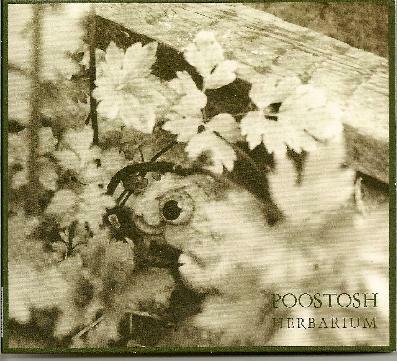 Poostosh - "Herbarium" / "Untime"
From Moscow, Poostosh is Mikhail Salnikov, Andrey Kovalenko, Andrey Gavrilov and Vitaly Chaplin. OVERJOYED TO HEAR THE NEW POOSTOSH ALBUM: uptempo melodic acoustic strum with found recordings of people talking. LIFE AS WE FORGOT IT: slow piano march with spacey sounds abound, yes it's very quality pleasant space music! RAIN AUTUMN DPRSSN: rock drum beat run through effects, a very cool result not done by bands enuff!? Poostosh are much more relevant than previous Russian bands I've reviewed who were very into Emerson Lake and Palmer. SASHA: guitar loveliness with waterfalls of sound along with dishes breaking and shortwave radio sounds!? Some nice fluteness. A quality release well worth whatever amount of money is being asked for it! Now some spoken vocal, very strange. LEPRECHAUNS'S GANG: whiteboy tabla along with the magical sworl of Poostosh! Uncatergorizable! BIRTHNIGHT: the basic riff is very similar to a Robert Calvert song!? More spacerock coolness. SWALLOWED BY UNTIME, VOL.2 (LIVE): prolly the most conventional sounding riff so far! Some nice melodica playing by Mikhail. CORNEAL ABRASION: abrasive corneal music on this one, pretty cool, pretty neat. LA STORIA DI UN RAGAZZO CHE TROVO' L'AMORE MA PERSE LA TESTA: this is the first song that sounds "Russian". THE MEADOW OF MY INFANCY: melodic pretty accessible piano music. DREAMERS WHO ARE BROODERS (ALMOST LIVE): not one of my most fave Poostosh songs because the drum machine sounds like a drum machine. FREQUENCY DOMAIN OF LOVE AND PARTING: the pretty outro song, oh no! it's not the last song. WE'LL BE BACK: more piano stillness, I hope these guys are huge in Moscow, they deserve it! No American Idle B.S. here!!! 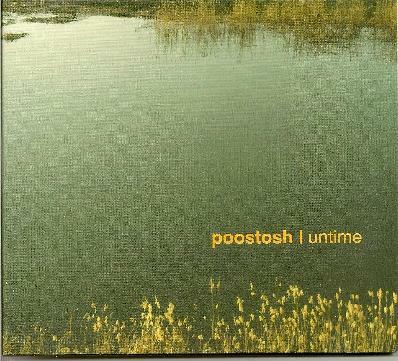 Untime seems to be an earlier CD than the Poostosh Herbarium release! For this album we have Andrey Mityaev instead of Vitaly Chaplin. NACHALO: nice driving "psychedelic" rock, no drums. SWALLOWED BY UNTIME: more soaring beautiful space rock! Very fluid, magickal! Every time I hear this track it sounds so familiar, like a piece of music I've known all my life! PASTORALE: more loveliness, some water pipe sounds, every good freak album needs some! SOUNDTRACK FROM "TRISTESSE": acoustic guitar, weird vocals that sound like they were recorded from the distant past! TELL ME ABOUT PEYOTE: what a great title for a song, ya know it will be great!!! Makes me want to dig out my Carlos Castaneda paperbacks. Maracas, flute, acoustic guitar, sounds almost Native American, like a recording of a peyote session. MAN AND SKY WANDERER: more experimental avant gardeness. BEFORE: a sign that this is a quality album is that it's conducive to multiple listens, it gets/sounds better with every listen. THEN: sounds like the soundtrack to a spacey western, some cool melodica by Mikhail Sainikov. DREAMING: light, atmospheric intro with elephant? noises, maybe it's a water buffalo? Some spoken word in Russian with machine gun fire, yes it's like a dream. UNTIME: cool title, like the Aborigine Dreamtime? More spacey atmospheric unmusic! DETSTVO: more of the same with acoustic guitar strum along with atmospherics and found recordings of talk etc. A lot of these tracks seem like longer pieces broken down into segments which work nicely and makes for a great album of untime music!! !